An adaptation of the King James Version Bible featuring emojis is scheduled to be made available on iTunes Sunday. The book is called Bible Emoji: scripture 4 millennials. 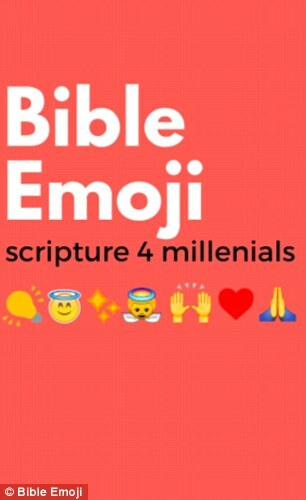 Its book cover features several emojis, two of which have halos. Bringing "dumbing it down" to a whole new level. Seriously, when my wife forwarded me the article, my first reaction involved Whiskey, the Tango, and Foxes trotting. After reflecting on this over the weekend, my opinion hasn't improved any. I think there will be a lot of reactions similar to Eric's. My one problem with it is that they use the angelic emoji for God. So now I am wondering how they represent the word "angel". Never mind to my previous question. The rest of the cover was the answer. I'm not a 'millennial' but if I was, I would find this insulting and condescending. I would say that just because I'm young doesn't mean that I can't read or write standard English and need to have everything in text speak to understand it. All these attempts to try to appear 'hip' to appeal to the young only make you look lame, not hip. I'm rather shocked by the reaction of people in these comments. It's clearly meant to be funny and interesting, certainly not anything any "Millennial" or young person or frankly ANY person would find insulting or dumbed down, because they would completely understand that this is meant to be humorously cute. I also appreciate that it is light-hearted and a little irreverent, in much the same way that the LOLCats Bible is not meant to be taken seriously. And despite that, no one will have any idea if this just happens to be the first Bible some person might read, and spark their curiosity, and lead to something significant (and with a properly serious translation). Jesus Christ might very well be shaking his head with his face in his hand, but it's more likely he would do that because of the way y'all are reacting to this. The totally awesome LOLCats Bible! I find it neither funny or interesting. I'm no language expert, but think this nonsense is bad enough when used on social media. @Jason Engel - As far as Jesus shaking his head because of how we're reacting to this.... I call BS on that. Again, I'm no language/literary expert/snob, but this "translation" (using the term about as loose as it gets!) doesn't show the Word of God much reverence. Apparently, I am not allowed to laugh at idols. I'm supposedly a millenial (born in '86) and I find this pretty condescending. Especially the 4 for "four". That hasn't been hip in at least 20 years by my understanding. That perfectly illustrated why Christianity writ large should cultivate its countercultural, prophetic cachet and not try to be cool: because our idea of what is "cool" in secular society is often hopelessly out of date. Taking this thing seriously is pretty dumb on my part anyway. It's obviously a novelty meant to make some money due to people buying it as a gag gift. If there's a silver lining in that perhaps this shows that emoji culture has peaked and will now decline. A serious way to reach millenials with a bible would be something along the lines of a Biliotheca or ESV Reader's Gospels: something we'd have to swallow whole. FYI the emoji bible is getting press on "Morning Express with Robin Meade" on HLN this morning (Fri 6/3). This is blaspheme. Kyrie Elesion. I guess every civilization has to end sooner or later. I'm not offended (I'm a millenial btw). I think it's kind of cute.